I am very excited about this product because, like many women, I am on the constant hunt for the perfect BB Cream. I have tried several different brands and they each have had their downfall. In the perfect world the best BB Cream would be under $10, have some sort of SPF coverage and gives my face full coverage. I have a little embarrassing issue that I have dealt with my whole life. This issue comes and goes and gets worse each month and then gets better. I have struggled with acne on my face for a long time. As a teenager it was embarrassing, but normal. As an adult, it is just plain embarrassing. This is why it is even more important to me to have have excellent coverage. I also have extremely limited time in the morning being a full time working mom of 2. Often times, it is just me getting both of the kids up, dressed, fed and out the door in under an hour. I pride myself on looking well put together and let me tell you- it is a terrific feat. I received Hydroxatone Anti-Aging BB Cream to review and I am so glad I did. This product costs $39 from Ulta (again, join the club and you will get some great deals!) and Hydroxatone has a great line of products. The Hydroxatone Anti-Aging BB Cream has a very nice package and the bottle it comes in is very classy looking. I will be using this product and I will be exploring more Hydroxatone products. I will be reviewing this product using Ultas review language to help while purchasing this product. I do think this product is easy to use and the packaging looks great. The cream itself is non-greasy, does not smell made and applies easily with an applicator sponge. Once I applied it, it does even out my skin tone, improves my skin texture and does have noticeable results. It does not dry out my skin. The best usage for me was blending my pores, evening my sensitive, splotchy skin and covering my blemishes. 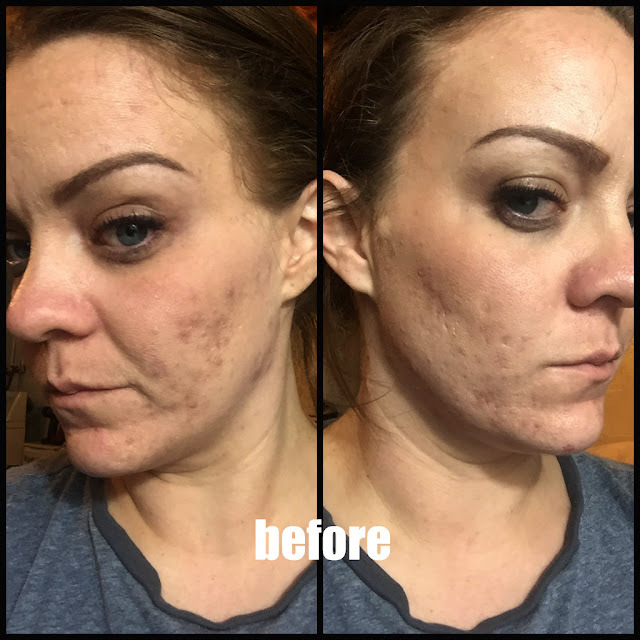 In the pictures below I wanted to show the great coverage this product has. I always like to use the gross scar on my arm, because it's always a challenge to do anything with! The first picture is the scar with nothing on it and the second is the scar with Hydroxatone Anti-Aging BB Cream blended in. These are a couple before and after pictures of my face. I also should mention that for the full coverage this product offers, it feels so light weight on my face. This is a huge pro for me because I have loooooong days and I don't want to feel like my face weighs 50lbs. Don't forget what makes Hydroxatone's BB Cream different than others! It Multi-Tasks!- It hydrates, conceals, protects, reduces the look of aging & brightens the skin! Broad spectrum SPF 40- Does your other BB Cream have that? Think major protection in a tube! Plant Extracts- To help calm and sooth irritated skin. Packed full of Vitamin C- Stimulates collagen, supports optimal skin health by promoting the skin's own regenerative properties and helps to brighten the skin! Nice review on this bb cream!